The year was 1969. I entered this world and life in human form began. A life that was full of moments….of being truly in the present. Do you remember learning to walk? Or talk? Or eat? And what about laughter – didn't it just happen spontaneously? Okay, so maybe recalling these early life memories isn't fully possible. We see it, though, when we see a baby – today – doing these things. Things each one of us did, too. Life began – for all of us – with moments where we just tried things. We just went "out there" and did it. Did we fall? Did our words come out jumbled? Did we get food on our face? And you know what – none of that stopped us! We would just keep on doing it – and getting better each time. Oh…and laughing…I'm pretty sure we all did lots of that!! Even if life seemed hard or challenging…laughter was still there. Do you fully grasp that? Do I fully grasp that? As a baby in this world…this concept was so natural to all of us. As we have grown older, do we always remember that? If you are having trouble viewing this, please click here. This video, created in conjunction with The Levity Project, epitomizes truly living in the moment. Note: I'm in there, on one of those big blue bouncy hippity hop balls! Everyone involved in this – everyone! – went into this event with some unknowing of exactly how this would all happen. And yet, all of these amazing people – from all walks of life – came together to create this moment…a moment of joy for all those awaiting the start of the Yarmouth Clam Festival parade. There were moments of confusion. There were moments of chaos. There were moments of "last minute change". And then, it came together! This moment is YOUR moment! Having that child-like quality of wonder…it really can lead us to try new things…venture new places…and really be in the moments of our day. And…that’s a place I want to be at more often, too…. PS. seems it was my pc, can watch it now! You shine that superman (…or really…superwoman!!) spirit!! It’s even the name of your site!! Very uplifting, Lance. Remembering that age when we did things such as learning to read, write, swim and ride a back reminds us of our connection to our superlatively creative nature. That spontaneity and freedom is always with us waiting to be released. My dad has always said this platitude… “Life is not a dress rehearsal” and I try to live my life that way. I want to live a creative life… creative problem-solving… slapping paint on my walls… buying local art… encouraging exploration… but I also want to live without regrets… from things I would like to try by lack the courage… from things that aren’t part of my heart… from things that are holding me back. Thank you for reminding me of that, Lance. From everything I’ve witnessed from you, I’m just drawn in to the beauty of your creative flow!! Keep shining that…always!!! And your father….a very wise man!! Great to have you here, sweet friend…. If the generally accepted age of the universe is correct, then I was dead for 14 billion years before I was born. Comparatively, I will get (maybe) 70-80 years of living. I try to remember that each day. Some days are easier than others, but thoughts such as these can make a difference. You made a difference in my day today and I thank you. That’s a great way of looking at this!! In the grand scheme of things, our time here is so short…let’s use it to what rings true for each of us! That is one long and beautiful smile. I know there are times I worry too much. Not sure what I’m doing, but in the end it usually ends up being interesting, filled with laughter and love. Great video Lance! I hope to join in on one soon. And you know what…that’s a smile that stayed with me for a long, long time!! Laughter and love – can’t beat that!!! And yes – one of these days we ARE going to hook up!! Its like when we learned to walk and talk, we didn’t plan such a momentous event. We just let it happen. We allowed ourselves to unfold naturally. Those parents then who push too hard to make these things happen, then create unexpected turbulence in one’s later years. We no longer remember such events because there was nothing to think about. It was all felt. Plan not, and every moment is special as the universe then throws us a surprise party, where each step is then celebrated like a gift unwrapping its self. These moments too do not need to be remembered for they are embedded in the fabric beyond time. The past is always here Now. The moment can be spent generating new feelings that are broad-casted instantly into the environment, changing life as we know it, forever more to come. That’s it!!! We just went out there and tried to walk…not thinking this was some epic moment in our life. And yes…every moment is indeed special…and so worth savoring (even those which seemingly are challenging). What impactful writing, Lance and I loved the video! I love this encouragement to play more and take ourselves less seriously. And how sorely do we need an anti-gravity movement — thanks to the people behind The Levity Project! Thank YOU!!! Being a part of this event (the one in the video) was really just so meaningful…and filled with such joy! And it really was about playing…and in that…seeing the fun in life! Wow, some really inspiring, motivational words followed by an amusing example of what you wrote about. First off, I love your message about living now…so true and yet we (I) seem to forget this often. The video is very funny and it looks like you got some great reactions to all the bouncing around you did. It looks like you really lived that moment to its fullest. Thank you for a slice of fun today! I too let this message slip too often…so this is such a great reminder for me, too. And all that bouncing…all that laughing…all that silliness…so, so fun (and just really good for the soul)!!! When we are child, everything is new and amazingly impressive. I know with child’s eye, as I teach Kg, 1and 2nd grade, that they are simply want to know and eager to learn. I bet we were like that as a children, it would be nice to go back that wonder of new excitements and joy of learning and doing things without any exception. What a wonderful gift you are…teaching these young souls as they begin with wonder! And yes, kids just really get this concept of wonder and joy and being in the moment. Such good lessons for all of us…. I see Kelly just go for her dreams with no fear ever that she will fail in anyway. So spontaneous. Anything is possible with her and her friends. They just jump in. They don’t question or worry. They GO FOR IT! We all should be that way. I think I am getting more fearless with time, but still a kid. And being a kid is fun!! You know what…hopping on that ball was a whole lot of work!!! I counted that as my exercise for the day!! Wow!! Kids…they really do just “go for it”!! And it’s so fun to see…to experience. And Jannie…you definitely shine that “kid” gene!!! One of these days…we WILL play together!! There are too many great things about this post to name just one so I’ll highlight my faves. 1) The first boy in the video. I loved when he said, “I like the hat” and then did a little shimmy. 2) When you mentioned, that when kids fall, stumble over the words, or mess up, they ALWAYS try again. I think that is what is missing from most adults. One failure and most of us give up. I want to be more fearless. I want to be a kid again. Failure doesn’t have to mean “failure”, does it….it can just be a stepping stone to more greatness!! And…Angel…I’m with you on wanting to be a kid again!! In fact…I hear a little too often from my wife that I am “40 going on 10″….hmmm…. I can’t see your first pic but I am sure it is a good one! great post Lance. I think many of us wonder why we change so much as we age… life takes over & the kid leaves.. we need to keep the kid!!!! I love the quotes as always! I am on the run this morn so will have to watch the video later.. a treat for sure! 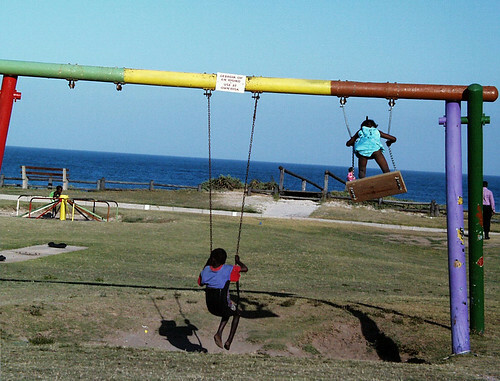 That first picture…kids on a swingset!!! And that just reminds me so much of being more kid-like!! And here’s to keeping that kid in us alive and kicking!! Hi Lance .. fantastic .. and what a marvellous group – such fun you all had. Brilliant video to remember it all by – the laughter and belly laughs as kids .. when you rock around, fall over etc .. Loved it .. the TED video would suit the above project .. see the link in my blog – it’s interesting to say the least .. hope you get a chance – I know it’s 18 minutes – but I don’t think you’ll regret watching it – it went in a flash for me .. This “longest smile” was so much fun!! Everyone who joined in just fully embraced the moment, the goofiness, the fun!! I will check out the TED video – they are always so good!! Thanks!!! And you, too, Hilary…you are a STAR!! Thanks!!! This was so much fun!! And – that it brought a bit of joy and fun to others, too…even better!! I often look at my four-year-old son and admire his ability to live HERE and NOW. Every new day is an adventure for him! One morning when my husband and I were both really tired, I looked at our son who was jumping up and down on our bed, excited of the new day. “Why aren’t we jumping on the bed?” I asked. “Imagine what life would be if we started every new day like that, jumping and singing ‘Let’s go to wooo-ooork, le’s go to wooo-ooork!’ ” – I honestly think we should try it one of these mornings. It’s great to have you here!! Four years old!! What a great age for truly being HERE and NOW! And everything is an adventure, everything new. And I LOVE your (or perhaps your son’s) idea – of starting the day by jumping on the bed!!! What a beautiful way to wake up to the day!!!! And…FUN!!!! In 1969 I was a Senior in High School. I graduated in May. Okay…so you have a couple of years on me!!! This was a BLAST!!! It was so fun to be a part of this SMILE…and to just witness the reactions of those watching! It is up to us in how we’ll live our lives. I suppose, to some extent, you could say we are dependent upon others, too. Still, we always have the choice in our responses…and in that we can LIVE…. Words provoke and summon feelings that we then wear and act out. Dependency feels heavy and weighty and locks one in place. Perhaps we are in connectivity with one another. The connectivity allows us to fluently exchange information and to change and to celebrate and to parade new ideas and feelings. I loved your Parade Lance. It felt really good. To this moment in time, I suppose I had a negative association with parades. Whenever I saw them in person or on television, I got a really bad feeling from them. It was as if they were all constricted and wearing chains. Walk in a straight line…..move this way and that way all at once in a mechanical way…. a true reflection of the old society. But Lance you parade with an open heart. I like parades now as if for the very first time. Thanks for the return visit. And…for your kind words. Yes, there really was not much “mechanical” about how we did our pre-parade activities!! And that really did add so much to this…the spontaneity of it all. Bern, know that I very much feel that connection to you…and in that…a stronger and more meaningful connection to our world…. I love the idea of approaching life with the fearlessness of a child. The fearlessness of a child…a pretty sweet thing (….usually…)…. Wow, this video just made my day! It’s beautiful, how fun! My dear friend said she was listening to a audio of Tolle and he said most of us spend our moments doing one of three things. One of those things was thinking of the next moment. My friend, one of the most aware people I know, said it stunned her to realize she was constantly doing this. I know I do too. I love the Lincoln quote, I love life, and I love the moment. Thank you Lance, once again, for bringing it on home to us – the joy of life and the power of our moments. This was such a fun day – even with the challenges that came up along the way. And in the end – just being out there, being a part of this SMILE…so, so FUN! And that idea from Tolle….ah, how I can relate. Yet, when I am truly in that space where the moment is just that…it is such a connecting experience (and something I am really attempting to do more of…). Lauren…thank you for being here…for shining your amazing love and light…and for your friendship. What a fun video Lance! I want to be happy as a clam too,sounds like I need to get me one of those big balls! Thanks for the social change you promote through laughter, what a positive energy to use to bring people together. Your mission continues to impress me! And this video was such a fun thing to be a part of!!! You know what I think….YOU dancing the line dance (on video!!!) …that would make you (and ME!!) happy as a clam!!!! A dancing clam!!! Okay – AND you on one of those big bouncy hippity hop balls…way fun, too!!!! Thank you so much, Audra, for all your wonderful support! Love, love, love this post and video! You really have your finger on the pulse of the Universe Lance. The message you send through this post is both timely and timeless. Perhaps it is natural, or at least common, that as we grow we get away from the attitide of the very young. I like how Joy put it in the comment above “As babies, we don’t ‘think’ of failure..we just know what we want..to walk, to eat that piece of chocolate cake, to have our smile returned..so we step out, reach for the cake, smile..and life is fabulous just like that..” Right on! As Joy pointed out, this works just as well in adulthood. Let’s do it Lance. You’re a man on a mission, and I want in on the action! Spreading love and joy right where we are. I know that it is in this way that we can impact our world. So, I’ll start here, you there and we’ll meet in the middle! You most certainly rock, my friend. Thanks!!!! You are really so awesomely kind!! Yes, Joy really hit upon it…with how as we get older…we “think” of how we might fail…and then are held back by that. I’m going to make the best of this day and leave the people I meet up with feeling better about themselves, just like you did with this post, Lance. You DO always bring a smile to my face…and that’s your sweetness shining through!! Great to have you here! After spending a weekend as a volunteer counselor at a camp for kids with Pacemakers, Life: Do it now is so meaningful. We need to get out of our own ways, stop worrying so much and just live life to the fullest. There wasn’t one moment over the weekend where I wanted to sneak away and check my computer or visit Facebook, or the like. I just wanted to enjoy each and every moment with these kids. Hey bouncy girl!!! I had so much fun on that hippity hop ball!! And…wow! it was a real workout, too!!! Awesome to see you in pictures at the camp! And…what a gift you are…being with these kids, sharing some real moments of joy and connection! I can’t imagine what that must be like, as a child…to have a pacemaker. And yet, they look so happy. And that’s them truly living in the moment…which is a lesson for all of us. Life is now…. Janelle´s Last Fabulous Post ..Competition- Jealousy- Forgiveness – OH MY! Welcome!! It’s great to have you here! Those bouncing hippity hop balls were so fun! I’ll be over to check out your site! What a beautiful post, thank you for sharing this with us! That video brought tears of joy to my eyes! What pure beauty! When we let go of our worries, limitations, stress, and negativity we truely live in the moment. This was a beautiful sharing between a wonderful group of people, not only expressing their joy, but bringing it to so many others. I loved seeing the smiles on the faces of those sitting on the side of the street. And I saw you in the video! Too much fun. Keep shining bright dear soul, and bringing joy to those around you! Thank you so, so much for your sweet words. And that really was it – in that moment – I forgot completely about any daily worries, any problems, any issues that were there. I was just “in” that moment. Great to meet you! And – wonderful to have you here. Hi Lance! I love this ->”It’s not the years in your life that count. It’s the life in your years”. That’s a beautiful way to end your post. It totally exemplifies your point of making the best of the now and living your life fully. Celebrate every moment, every year. All we have is this moment, we might as well rejoice and enjoy it until the next moment comes. Your excitement about today jumped out of the page. Now I’m totally pumped up for today. Yes, it’s our day every day! Loving blessings! That Lincoln quote just felt so fitting to this. However long our time is here on this earth, how we live that life can make all the difference. And NOW is truly all we have for sure. So…I’m celebrating YOU at this very moment, and savoring the beauty your words bring to me. And that all just touches to my soul…. P.S. – Those hippity hop balls were so much fun AND a real workout!!! Wow, I was exhausted when we finished!!! FUN! What contagious laughter on the video. Thanks for the gentle reminder of how important it is to continue to live life like a child! Laughter…just to laugh…now that truly IS contagious!!! And so joy-filled!! It’s great to “meet” you…thanks for so much for the visit! Oh my gosh, I want a bouncy ball like that! I remember them being a workout, Lance, just like you said to Andrea. Ha! What a great video, and a great message you’ve shared. One step and day at a time. For me, if I can visualize the end result, I let the “how’s” fill themselves in and I don’t worry too much about it (usually!). Love you lots, my friend! These bouncy balls were SOOO fun!!! And bouncy!!! (wow, I got some good height!!!) …and whew…I was exhausted when we finished!! Big love and hugs to YOU!!! Thanks for another awesome post, Lance, and for keeping the smiles coming!!! Thanks!! This whole parade environment was sooo smile (and laughter!) friendly!!! Thank YOU!!! And…you know…I happen to think joy is a pretty awesome thing!! So, your words really are deeply meaningful. And – I know that you, too, touch upon joy in very special ways in your life!! So, having you here to see (and read) this – so wonderful!! Absolutely loved this – both the wisdom in your article and the fun and joy in the video. Thank you! Thank YOU so much!! Being a part of this Clam Festival event was such a blast! And truly – in those moments when we were out there – that’s all there was – that moment. And to be fully in that – so good. And then, to reflect back and really soak in this idea of doing…so, so good, too. Sandra, so good to have you here today! Ah, that innocence and childlike joy; I consider myself so lucky because I get to experience that every day with my daughter. She’s teaching me how to get that back, and each day is another reminder to be in the moment and just enjoy her love and laughter and cuddles. We get so caught up in the work we have to do, and what hasn’t gotten done, and bills, and all the drama in our lives. It’s all noise, and we let it overwhelm us. How lovely to remember to slow down, focus, and listen with the heart rather than the head. How wonderful – your experience with your daughter! And that’s such a beautiful thing – the laughter, the cuddles, the joy of children! So true – that getting caught up in the drama of our lives. Yet, when we simplify – and really see (and feel) the beauty of this thing called life…it all so wonderful! Delena, thank you so much for reading, for being here, and for shining your amazing light into this world! Next post: Apples And Pies And Barbara Oh My!